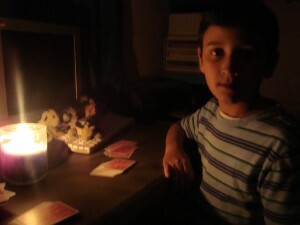 Earth Hour was today from 8:30 – 9:30pm in all time-zones. For more Straight Out of the Camera shots see Slurping Life. Straight out of the Camera Saturday: He’s a trooper. Best Special Needs Homeschool Blog 2010! 6 Responses to "Straight Out of the Camera Saturday: Earth Hour"
Ahhh… I love this image! You did much better than I; completely forgot earth hour. Excellent capture by candlelight…these shots are tricky. And welcome to SOOC Saturday. Thanks for the compliment, Melody. It really was a lucky shot.